Is your child a little bit accident prone? Then here's the perfect fancy dress outfit for him - a Mr Bump Fancy Dress Costume. Mr. Bump is the unlucky character from Roger Hargreaves famous Mr. Men books, who is always having accidents. 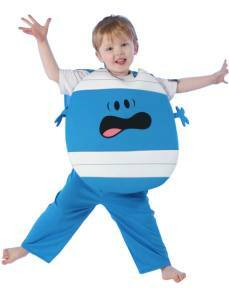 Mr Bump is easily recognisable making this costume a favourite for kids as they'll all have read the books. The outfit includes a blue and white tabard with bandages and a worried face printed on the front. It even has attached waving arms, as if he is about to fall over. Also included with is a pair of matching blue trousers.